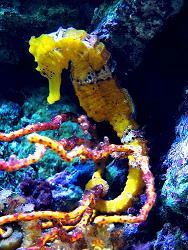 Love seahorses? Me too. This swap will be about sewing and decorating a small seahorse. When you sign up I will email you a small seahorse pattern for you to print. You will then create your own lovely version to swap with a partner. The seahorse is only approximately 6 inches tall and you can decorate him/her anyway you like, with beads, bows, lace..go wild, just create a seahorse that you would like to receive yourself! I am leaving plenty of time for the swap date because of the holidays coming up. EDIT: This is a very simple two piece pattern. Everyone is welcome just please dont have any no sends (if there was a problem, please email me and we will talk about it) Newbies(with full profiles) welcome. This is an International swap. Thanks luvcatzzz, with a name like that I must have you in this swap :)!!! Thank you Linz! Glad to have you!! I love seahorses and everything else about the ocean and the beach. I think I was born to die at the beach. I also love the fact that there is plenty of time to get our little fellow created. I think so too Biff! It would be great if everyone posted pics so we could see them all! <3 seahorses! They're so cute! omg have started to sew wee shelly up but having trouble lol any on else have trouble? I haven't started yet, but why are you having trouble? Hope I don't have trouble too! ...you got further than me I can't even aceess the pattern! Any tips? What software should I try to open it in? Hello everyone, Biff, can you still not get the pattern? I will be glad to snail mail it to you if need be. What kind of trouble are you having fluffywelshsheep? One sewing tip: I sewed around the whole seahorse then snipped a small opening in the back to turn and stuff it. I'm cutting my "First try" on the bias of some "hard to sew" fabric I can't name. ... it's see through with a design on it. very colorful. Thank you for the pattern and the time to complete the project. I got it! Thank you. Will really enjoy decorating these! Started mine now - top tip - stuff as you sew! I do have a question though: Q)Are people planning to add a loop so we can hang these up? Mine doesn't need a loop.. The one I'm making is almost done, it doesn't have a loop but I could add one if the recipient wanted one. I think a loop would be useful but am easy either way & will leave it up to who ever makes mine! I will put a loop on mine, but I don't mind if the one I receive, doestn't have a loop. I guess I better say too huh? lol...I do not mind either way. I think that if a toy has a loop and you don't want it it's relatively easy to remove it while it is more difficult to attach a loop when there isn't one but you want it, so if you are not sure better to attach one. As about mine, I don't usually hang toys up, so no loop needed (but OK if exists). It would be nice if this toy would be sturdy enough for games of two boys - they wouldn't put little pieces into mouth nor play football with it, but may press it into some small container supposed to be its aquarium or something like that. Sassybird and justingrind, Welcome!! I am having a bit of trouble with my email today, bad rainy weather! But will get the pattern to you asap!! I am so glad you joined! I don't care if mine has a loop or not. What is the best way to package this for shipping? My 2 concerns are: 1. postage is calculated by weight and size (weight isn't a problem, but the size is different than regular packages) 2. I'd like to sew on a few seashells that I have, but don't want them to get crushed in the mail. Any suggestions? As for loops, I was going to put a small one on, but if you dont want one, I wont. I don't mind loops either way, although thinking about it if it did have a loop means I could hang it on my dresser! So... yes i would like a loop please, if possible!!! I'm going to put a loop on mine- just in case- and would love it if mine had a loop so I could hang it somewhere on the boat where I could see it everyday!!!! Please can you send me the pattern to katcress@gmail.com ????? I'm interested in this swap & have been following everyone's comments - like luvcatzzz this is a little out of my element but if it's basic sewing I can handle that. My concern is how small it is - 3-4 inches? And how detailed it is ... would it be possible to view the pattern first? I'd hate to take on something that is really beyond me and that would be very unfair to my swap partner as well. Ok, The pattern is between 5 and 6 inches long. Mine is about 5 1/2 inches. You decide. Who has it smaller that 5-6 inches - check that when you printed out, you printed out "original size", not "fit on the paper". I've been reading through the comments. I would like a loop to hang. Mine would have to be shell free, Australian customs would probably seize the whole thing! Wow, we are so growing, this is wonderful!! I am so glad you all have joined! I'm looking forward to viewing the pattern to see if it's something I feel like I can do justice to! how do I access the pattern? As for loop or no loop, I'll leave it up to my partner...surprise me! When I printed the pattern, it came out to be 5 1/8" in length. I did check the printer setting, too. But the length should be ok, shouldn't it? Also, where does the fin go? (Silly question, I'm sorry) Thanks! Hello, If anyone has NOT received the pattern please let me know at Buftussle.Village@gmail.com. Valleyygirl and ozrob I am sorry to see you go. Well, I see the photo is not a good reference, the fin goes on the back, closer to the head. I will email you a better photo okay. Now that I've sent out the Dottee-dolls I was up for another small sewing craft swap! I am so excited. I can't decide do I want to bead, embroider, needlepoint, cross stitch, or all of the above to decorate it. Squee! I just finished sewing the outline, and am about to trim the fabric, and cut it out - wish me luck! I haven't done anything except for checking out the patterns (before assignments already) and looking at my partner's profile. As sent-by date is so far away and I have other swaps plus my child's advent calendar to take care of, I probably will not do anything except turning some ideas in my head during November. mickymoosies, your seahorse will swim your way tomorrow. I finally finished mine and have sent it off to Canada. I made mine out of fabric and even got the nose turned without blowing out the seam. A pic is in the gallery. I finished mine and will send it tomorrow or friday. I took 3 hours pulling out the tail and nose. I spent another 3 hours trying to stuff the very end of the tail before I gave up... I made mine more like an art doll than a toy... I hope that's okay. I put a loop on it and only decorated the front, grrr. I didn't think about making it more like a toy, I guess I should have read thru all the comments before. Mine will be off in tomorrow's mail! I forgot that international mail needs to be taken to the PO and handle by a clerk. Our's has been closed now for three days due to the weekend and MLK holiday. My little seahorse creation is now postal! I uploaded photos of sent/received seahorses but it automatically put my old user name, ddmaree instead of dandelion.